PROPANE CANADA is published six times a year: (November/December; January/February; March/April; May/June; July/August; September/October). The book is edited for the Canadian LP Gas industry and devotes its entire energies to the promotion and well-being of this segment of the oil and gas marketplace. The Heartland petrochemical complex represents the largest organic growth project in our history, and a key part of our growth strategy. 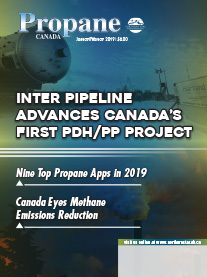 The project [is] designed to convert 22,000 bbl/d locally sourced, low-cost propane into 525,000 tonnes/annum (TPA) of polypropylene, a high-value, easy to transport plastic used in the manufacturing of a wide range of finished products.